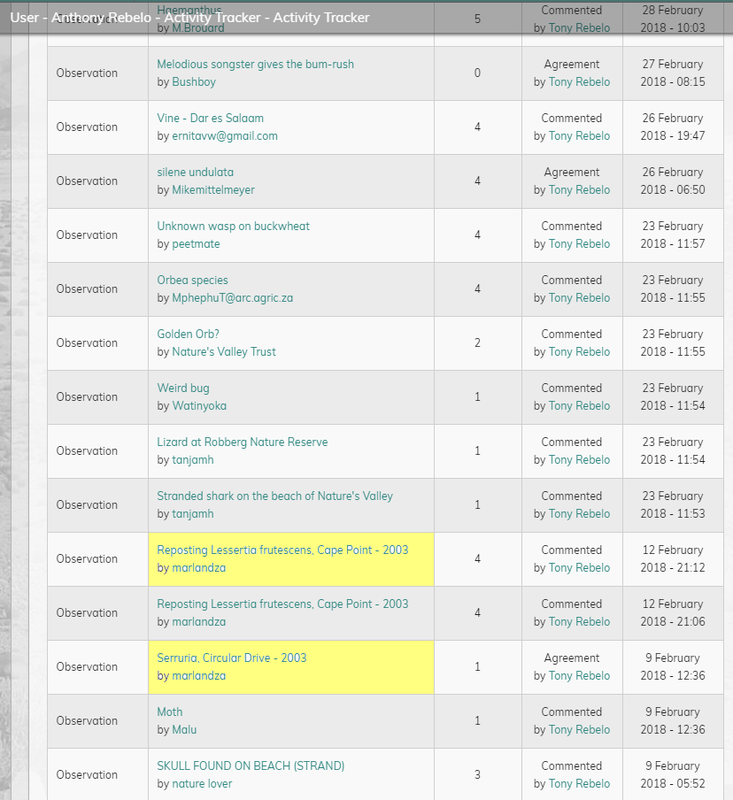 I've just got feedback from my Lichen pictures on Flickr, where I put a link back to my iSpot observations. "Good news: The names of the fungi of southern Africa are being updated and checked. The SANBI dictionary will hopefully be up to date for Lichens by June 2018. As soon as it is done we will upload it to iNaturalist." "The southern African community has migrated to iNaturalist at www.inaturalist.org with all its data in early 2018. Beware that southern African data on this site is out of date and no longer updated." I have no idea of how many times he has added this comment to my observations, but I would dearly like to have these comments removed. Looks as if I've probably got 623 Lichen observations. I don't think you're over-sensitive: this is simply rude. Chris's suggestion is a good one, but I'm not sure if it will remove all instances. Perhaps an e-mail to the contact on the main page, bottom right, might also be advisable. Tony is very 'mischievous' to the point of the inexcusable. i HAVE inappropriated some of his 'material' over recent months and in the last few days specially and have contacted him directly very recently. He is very sore of course. He drops in (will read this), abusing privileges which he abandoned months ago. There comes a time when you need to leave, if that's what you want to do, and move on. Tony has a grievance against the ISpot management but that's no reason to take it out on you. Feeling much better and hoping to stay focused on my special projects.